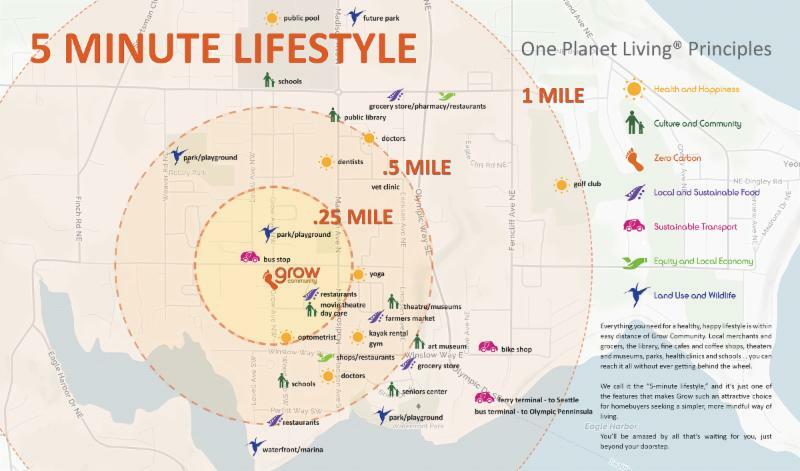 Everything your family needs for a healthy, happy lifestyle is within easy distance of Grow Community. Local merchants and grocers, the library, fine cafes and coffee shops, theaters and museums, parks, health clinics and schools … you can reach it all without ever getting behind the wheel. We call it the “5-minute lifestyle,” and it’s just one of the features that makes Grow such an attractive choice for homebuyers seeking a simpler, more mindful way of living. You’ll be amazed by all that’s waiting for you, just beyond your doorstep. 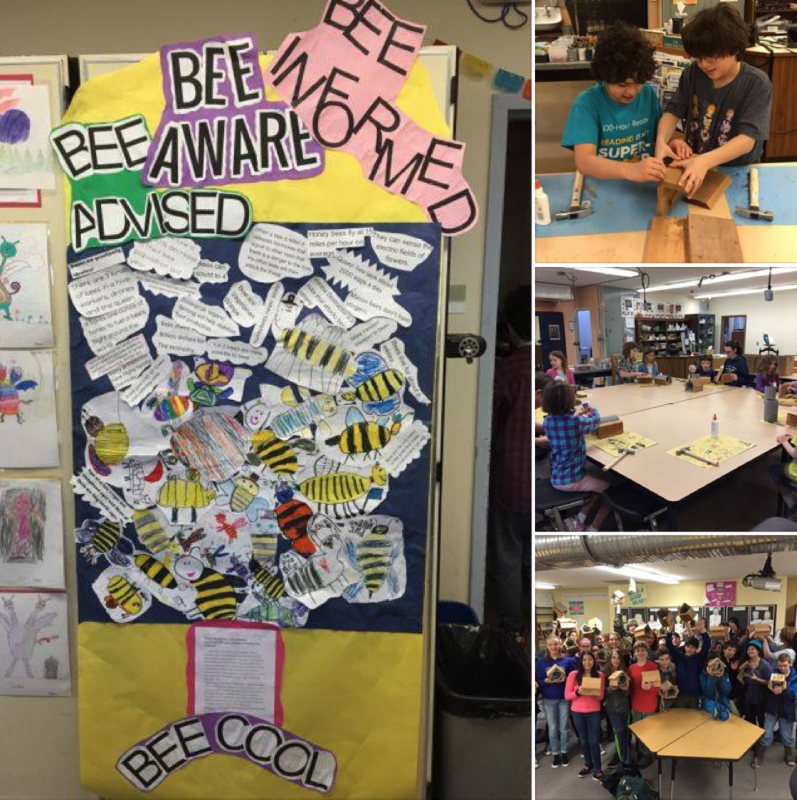 Bainbridge Island students are learning to “bee positive” on the environment, thanks to the efforts of local educators and volunteers like Carl Lindbloom. 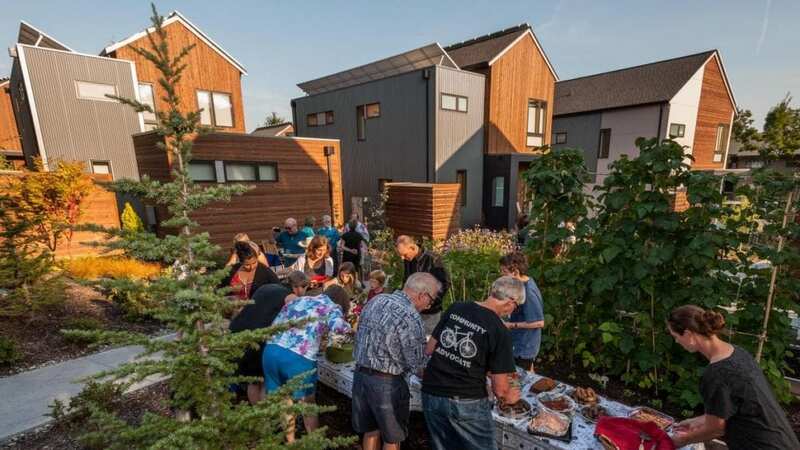 We noted earlier that Grow Community has signed on to the Pollinator Improvement Plan, an island-wide effort to bolster living and foraging space for bees, birds and other pollinators that are the linchpins of a healthy ecosystem. Our Grow landscaping boasts pollinator-friendly native plants with a sequential bloom season to provide food and habitat all year for pollinators – from hazelnut in late winter/early spring to Oceanspray in late summer. Each kit provides new refuge for Mason bees, so named for their skill at making little mud compartments in their nests. The new Mason Bee Houses have now gone home with the kids, along with instructions that give them everything they need to set up the houses and start raising Mason bees in their own yards. 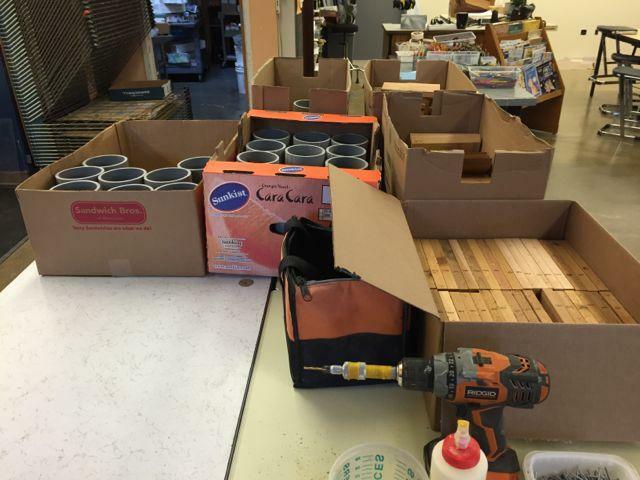 “Because we draw students from all parts of the island, we have now introduced Mason bees to the same,” Carl says. 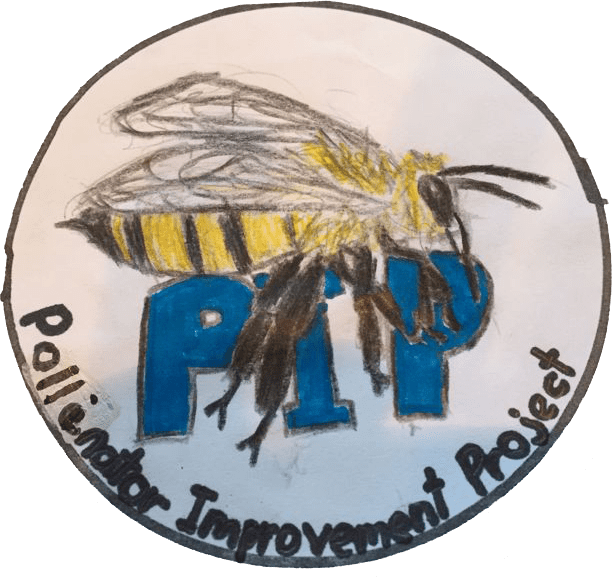 Way to go, Carl and Bainbridge Island students in the Pollinator Improvement Plan – our community’s own little Bee Brigade. Podcast on pollinators – listen in now! 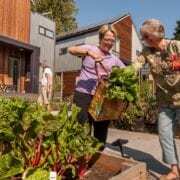 Not long back we announced Grow Community’s participation in Bainbridge Island’s new Pollinator Improvement Plan. 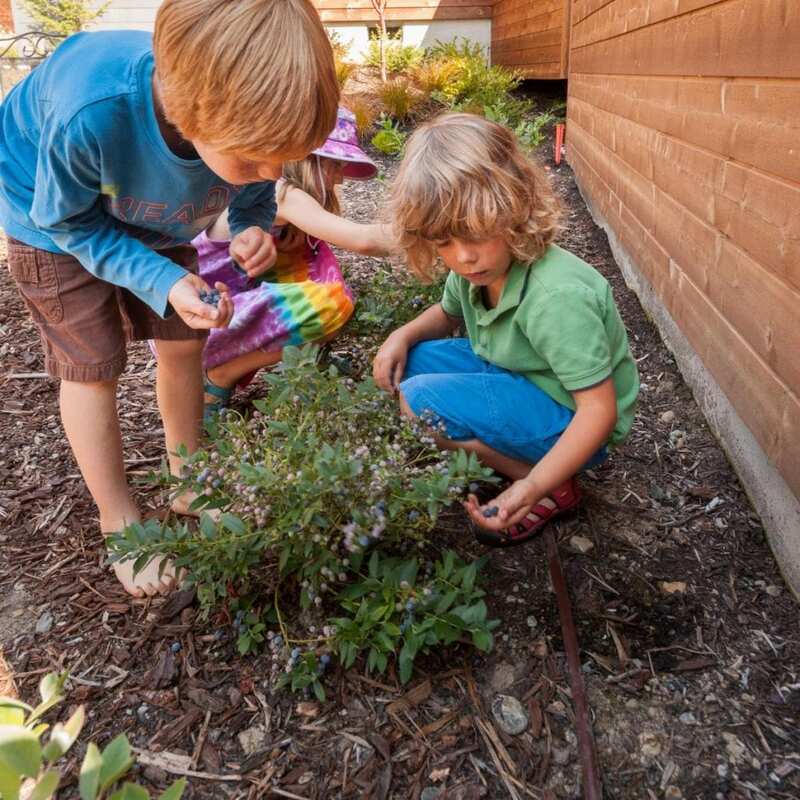 Landscaping throughout our Grow neighborhoods will be “bee friendly,” with a rich mix of native flowering plants to give our little pollinators plenty of food and habitat. 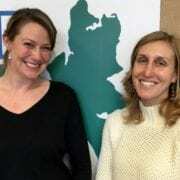 Now the PIP is featured in a new podcast on Bainbridge Community Broadcasting. In his program Community Cafe Bainbridge, host Barry Peters interviews two local officials about the island-wide effort to promote a healthy ecosystem by looking out for the bees, hummingbirds and other pollinators so key to our food supply as humans. 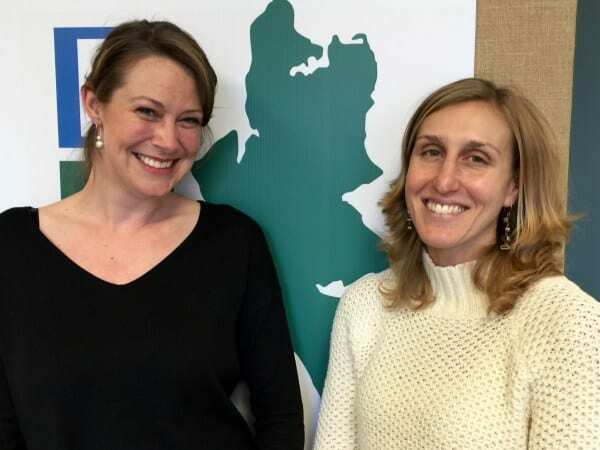 Heather Beckmann, Bainbridge Island city planner, and Amber Richards, assistant to the city manager, discuss the goal of linking different green spaces across the island so pollinators can navigate the built environment. Grow Community is glad to take its place on this welcoming corridor. You can hear the podcast right here. Find out not only how Grow is meeting the challenge to protect our pollinators, but how residents across the island can do their part by planting bee-friendly flower beds and gardens. 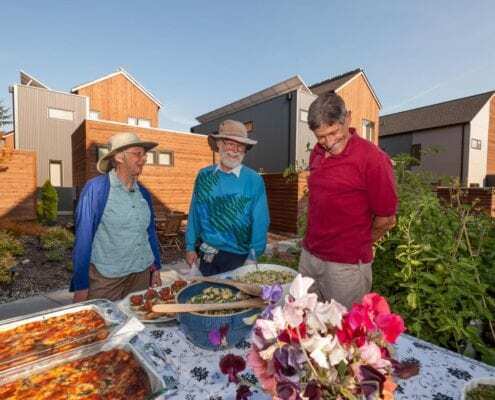 “We’re hoping all people would ideally get involved, so the island itself can be a sanctuary for pollinators,” Heather tells the Community Cafe Bainbridge. 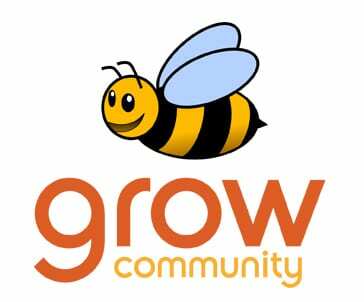 Thanks to Barry, Heather and Amber for the great podcast and for giving a shout-out to Grow Community as the Pollinator Improvement Plan moves forward. Bee well! https://growbainbridge.com/wp-content/uploads/2015/12/IMG_1932.jpg 450 600 Grow Team https://growbainbridge.com/wp-content/uploads/2018/05/growlogo-300x110.gif Grow Team2015-12-01 08:37:582017-01-30 23:47:54Podcast on pollinators – listen in now! Bees are the unsung heroes of a healthy ecosystem. By supporting flowering agricultural crops and orchards, they and their fellow pollinators butterflies and birds are responsible for as much as one-third of the human food supply. 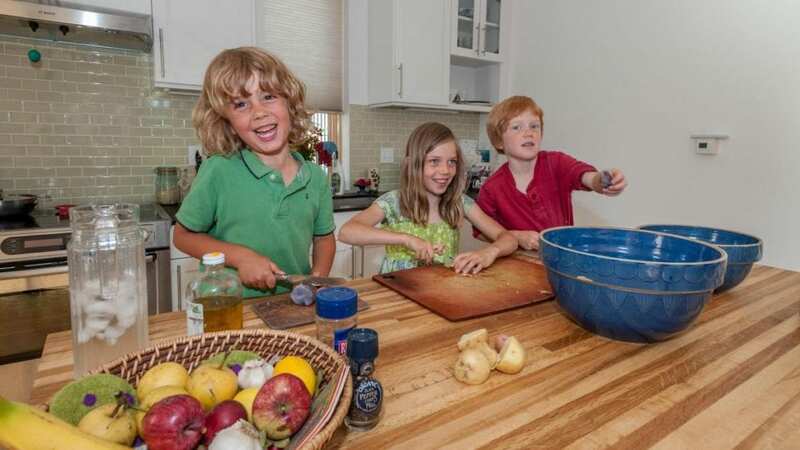 Enjoy tasty local cucumbers, strawberries, apples or even onions? Thank your neighborhood bee. 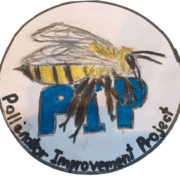 Grow Community joins the effort to promote our island’s pollinator populations through the Pollinator Improvement Plan (PiP), now under way at Commodore Options School. The goal: to create a network of pollinator-friendly micro-environments around the island, aiding the industrious apiformes as they seek out nourishment and shelter. Grow also features multiple canopy layers in trees, shrubs and perennials, to provide shelter options for pollinators. Planting under the direction of renowned firm PLACE landscape architects is now underway on the site, even as we round out the first buildings nearby for residency this fall. 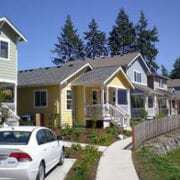 PiP is a joint project of Commodore Options program and the City of Bainbridge Island. 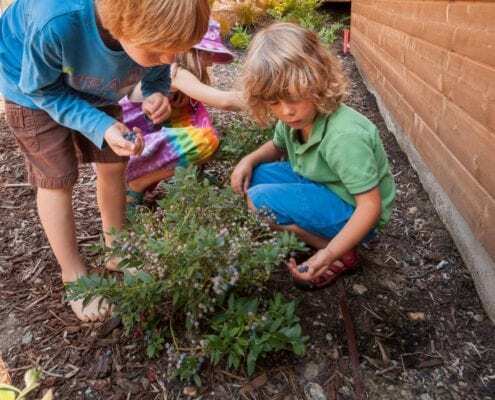 During the yearlong program, students will learn about the importance of bees and other pollinators to the natural environment as well as the various threats – overuse of garden chemicals, loss of habitat – their fragile populations presently face. 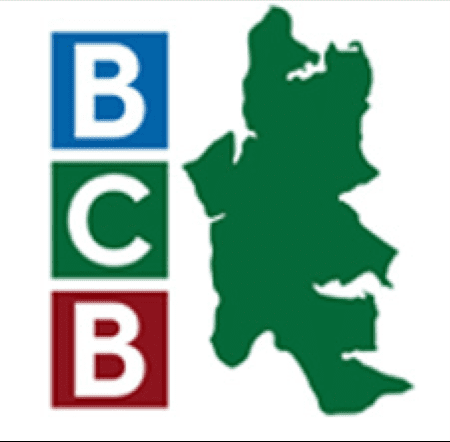 The multiage curriculum will include mapping of local bee habitats and production of a “Bee’s Eye View” video, to promote bee-friendly planting at homes and neighborhoods throughout the island. The video will be shown on Earth Day 2016. Participants will also work with the city to review local landscaping and pesticide policies, to make local public lands pollinator friendly. Students will be part of this community discussion. 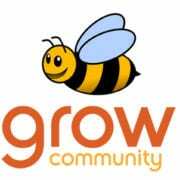 Watch for more news about Grow Community’s bee-eautiful plantings here in the coming weeks. 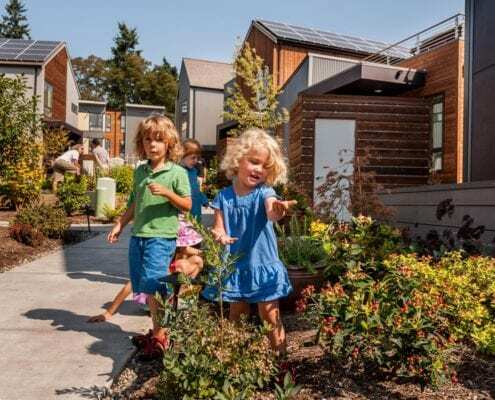 Grow Community as the new standard for future living? You bet. 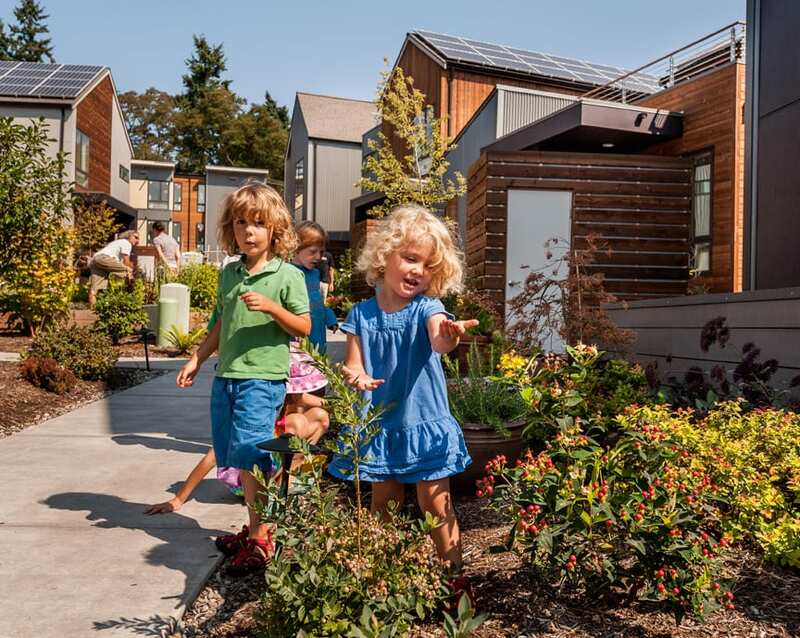 Grow’s award-winning, net-zero neighborhood will be showcased at Living Future 2015, the annual conference of the International Living Future Institute. Jonathan Davis, architect for Grow’s first phase, the Village, and project manager Greg Lotakis will be featured speakers at the conference, which runs April 1-3 at the Sheraton in Seattle. Living Future is a forum for leading minds in the green building movement seeking solutions to the most daunting global issues of our time. 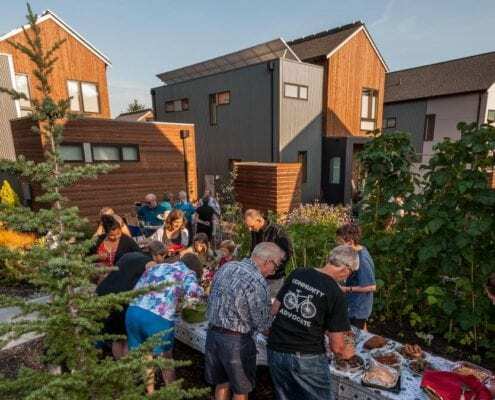 Out-of-the-ordinary learning and networking formats provide innovative design strategies, cutting-edge technical information and the inspiration needed to achieve significant progress toward a truly Living Future. The Grow Community presentation runs 3:15-4:45 p.m. April 2. 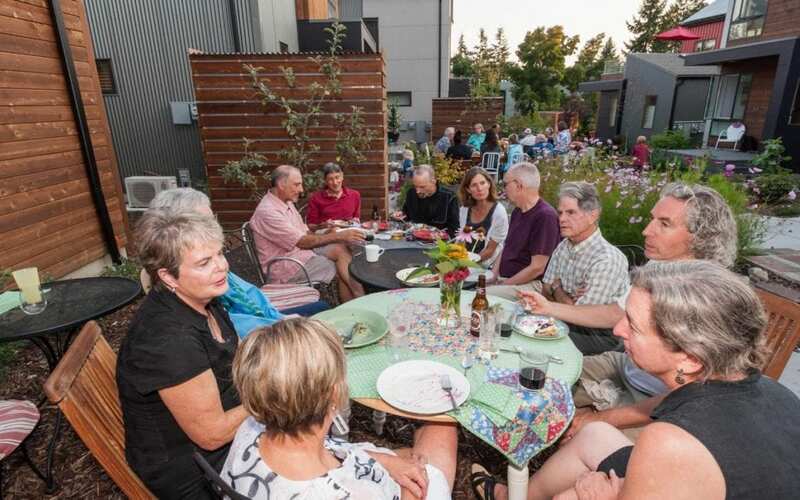 Even as we slip into a lovely high autumn, we can still take a fond look back to Grow Community’s summer garden party. 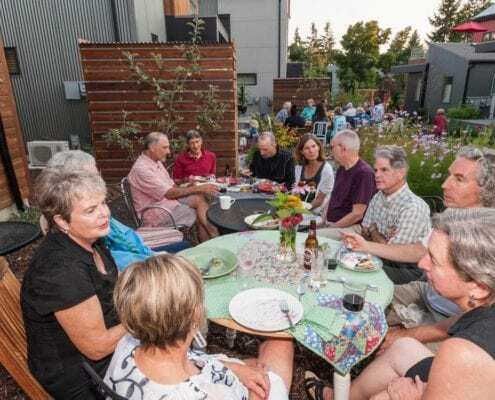 Residents of the Village celebrated the rich greenery and edible bounty found throughout the neighborhood with a festive and tasty afternoon get-together. Flowers in glorious bloom. Vegetables ripe and ready. 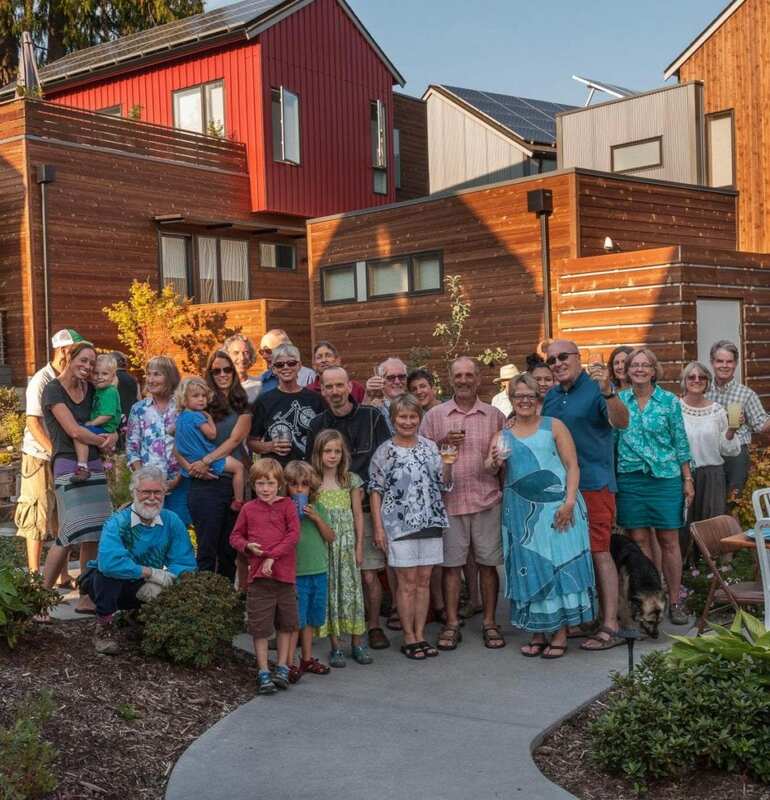 And neighbors who give the Northwest’s greenest community its amity and spirit. Now that was a day worth celebrating. We’re already looking ahead to next summer! 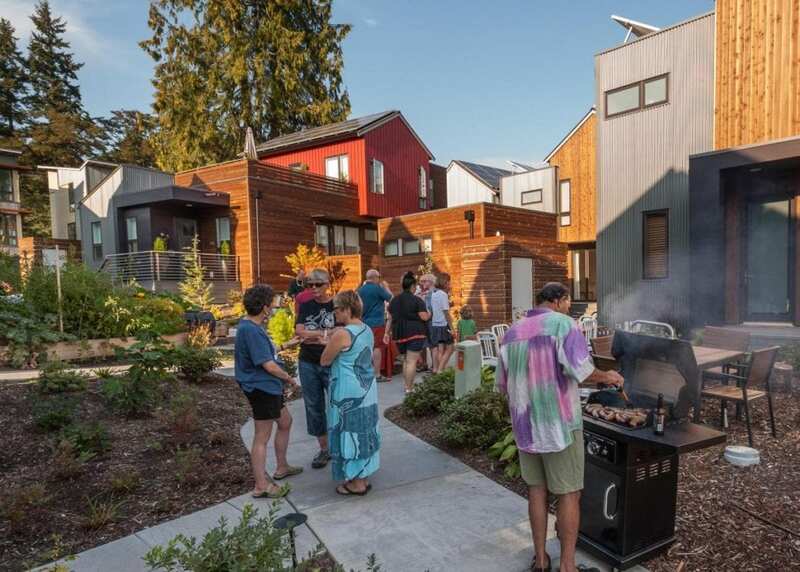 The aim of the Housing Design Demonstration Project on Bainbridge Island was to create incentives for developers to build subdivisions that offer green and/or affordable housing. Four projects taking advantage of incentives such as “bonus density” offered by the ordinance are in different stages of development. Ferncliff Village has completed 24 homes that are now mostly occupied, and the first homeowners are moving into the GROW Community, which will be the largest of the four, as it works toward completion of its first phase. Meanwhile, the HDDP, which was adopted in 2009, is set to expire at the end of this year, but a committee has been working on revisions that will be presented soon to the City Council, and a reworked ordinance could be extended for a few more years or made permanent. “The HDDP’s intent is to allow for clustered housing and preserving open spaces,” said Mark Blatter, executive director of the nonprofit Housing Resources Board, which developed Ferncliff Village. 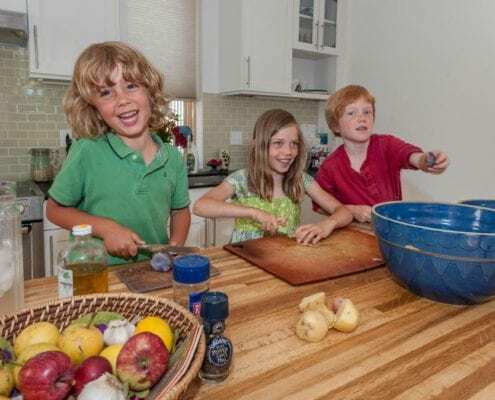 Ferncliff’s first phase showcases that concept, with the two dozen cottage-style houses on small lots, with a community garden and an open grassy area in the center of the development. Besides being shared recreational space for residents, the grassy area also handles stormwater runoff. 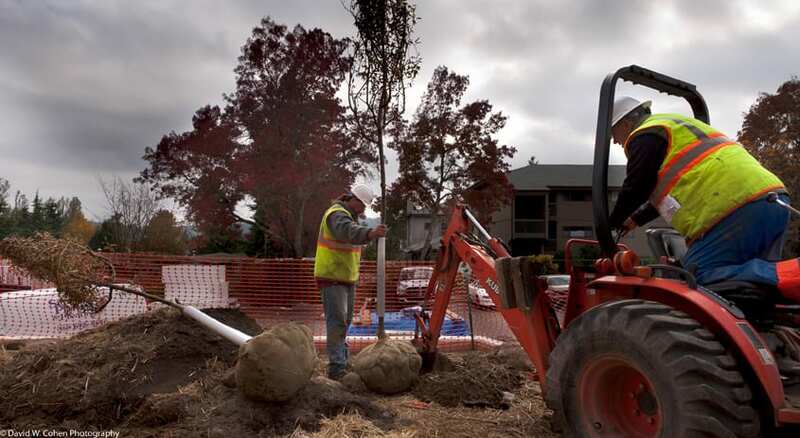 The six-acre site — off Ferncliff Avenue half a mile north of Winslow Way — was donated to the Housing Resources Board by former City Council member Lois Curtis. The HRB developed Ferncliff as a community land trust, which means the nonprofit builds and sells the houses but retains ownership of the land, with homeowners paying a low-cost, long-term land lease. “That’s part of the way we make it work as affordable housing,” Blatter said. The two — and three-bedroom houses range from 846 to 1,138 square feet, and are priced from $195,000 to $220,000. 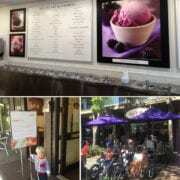 The Ferncliff Village website says the home prices are more than $50,000 below market value. 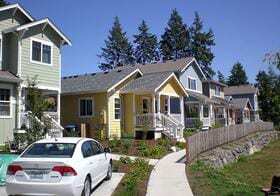 Blatter said qualified buyers are those with 80 percent to 120 percent of the area median income in King County, and additional subsidies are available for potential Ferncliff homebuyers with incomes below that range. It’s the only one of the four HDDP developments that meets the affordability goal of the ordinance. Charlie Wenzlau, a local architect who is Housing Resources Board chairman and also helped develop the HDDP for the city, explained that the ordinance has development standards structured in tiers on either a green building track or an affordability track, though they’re not mutually exclusive. “When you go with the affordability track, the green building requirements are still there but not as onerous,” he said. So even though Ferncliff put more emphasis on providing affordable homes, Blatter said the houses also include various energy-efficiency elements such as ductless heat pumps, Energy Star appliances and triple-glazed windows. 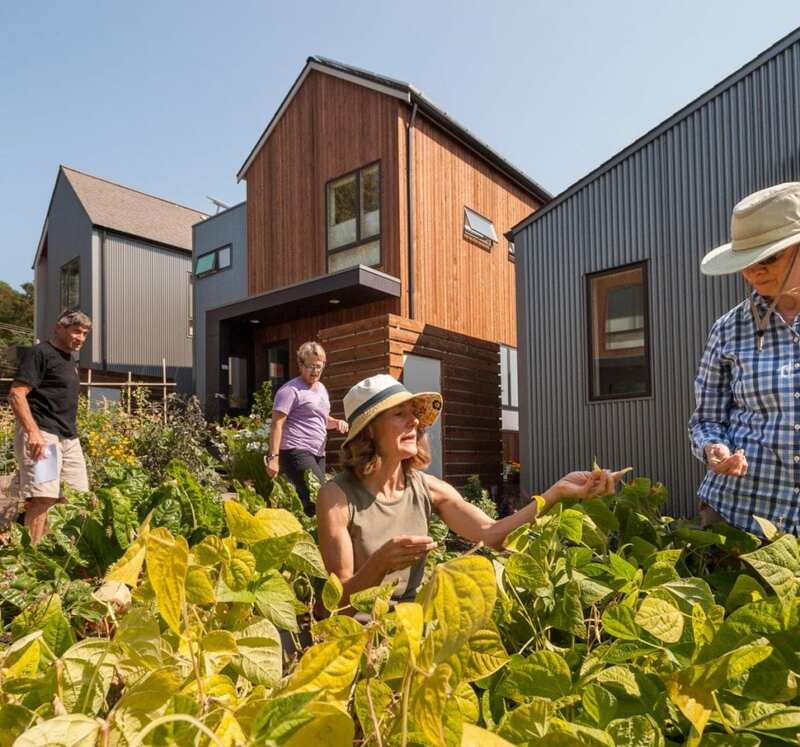 “We think these houses are going to live comfortably and large, even though they are fairly compact,” Blatter said. 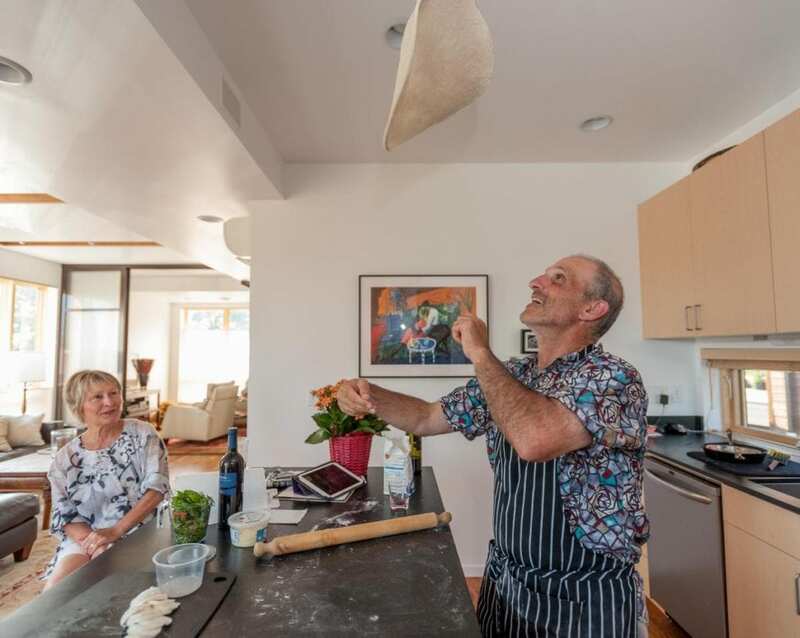 Architect Jonathan Davis designed the first phase of GROW Community and is buying a house there.Architect Jonathan Davis designed the first phase of GROW Community and is buying a house there. 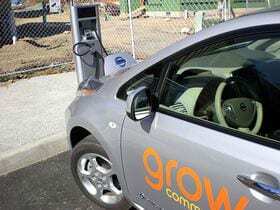 The GROW Community, located at the corner of Wyatt Way and Grow Avenue just a couple blocks from downtown Winslow, is on the green track and has incorporated more extensive sustainability measures, such as rooftop solar panels and a charging station for a shared electric vehicle available for residents to use. 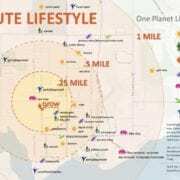 Jonathan Davis, the architect who designed the first phase being built on three acres of the eight-acre GROW site, worked with developer Asani to create a project meeting One Planet Community standards of sustainability. 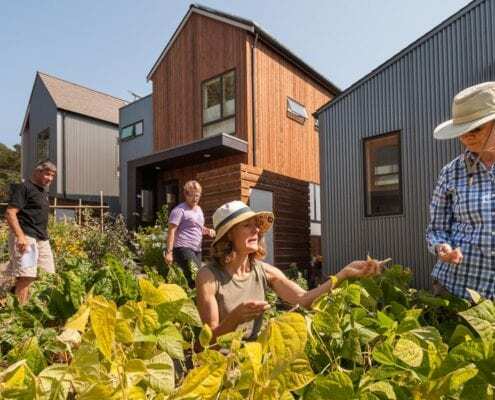 BioRegional, the global sustainability organization that founded the One Planet Living program, announced GROW’s endorsement at last year’s Earth Summit in Rio de Janeiro. 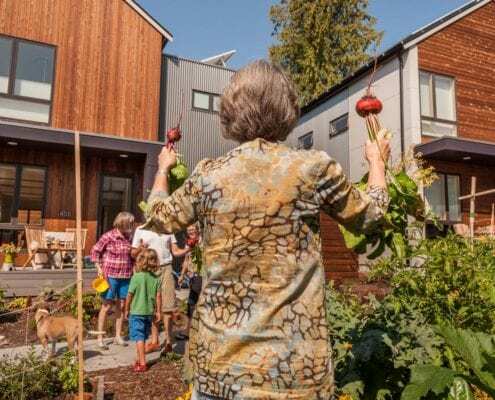 The GROW Community’s first phase will have 44 housing units, with 24 free-standing single-family homes or duplexes that are currently under construction, plus two buildings each with 10 apartments to rent. A park/play area space will be at the high side of the site near the Wyatt Avenue corner. Only three houses had residents in August, but Preston said builder PHC Construction is finishing about three each month, and should have all of them done early next year. She and Davis are both buying houses in Phase I. As for the HDDP, he said it’s “a brilliant ordinance” and “what it allowed us to do that’s most beneficial, is create fee-simple lots for the homes,” so they could be sold as single-family houses instead of condominiums, for which it’s harder to get construction financing. “Our density is no higher than what could have been built here” as apartments and condos, Davis noted. 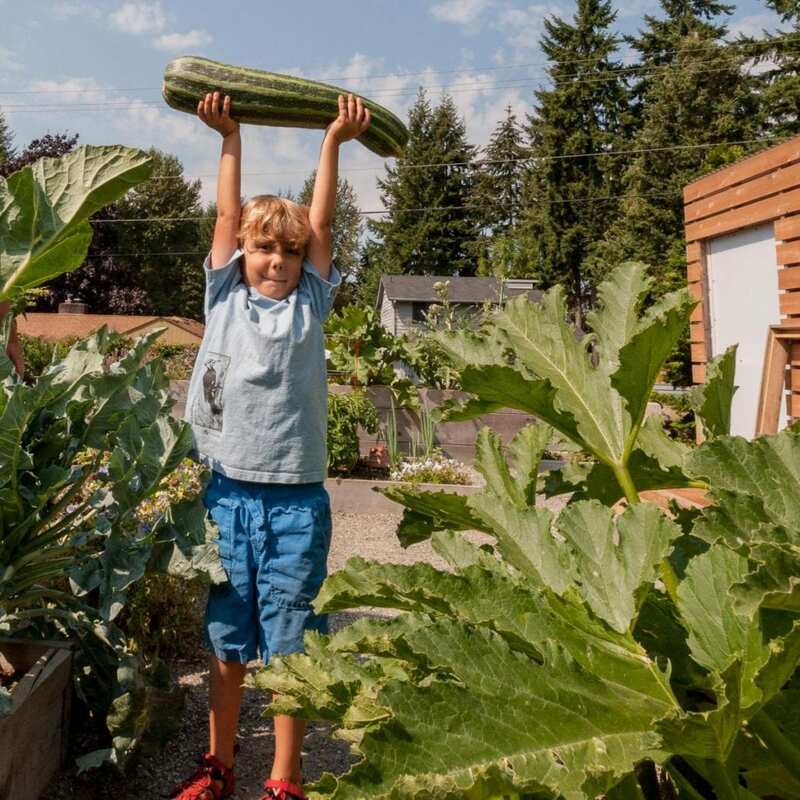 While he’ll soon be living in the community, Davis won’t be as involved as the second phase at GROW starts to take shape next year. 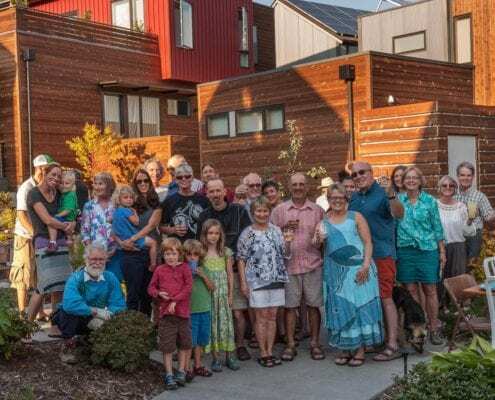 Asani decided to rework the types of housing and the site plan for the other five acres, and held a community meeting this summer to explain the changes. 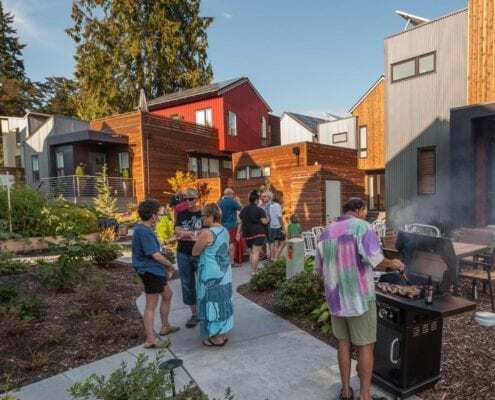 Instead of homes built mostly on small but separate lots, many of the new units will be in rows of townhouses on the sides of a large central plaza where a community center will be built. 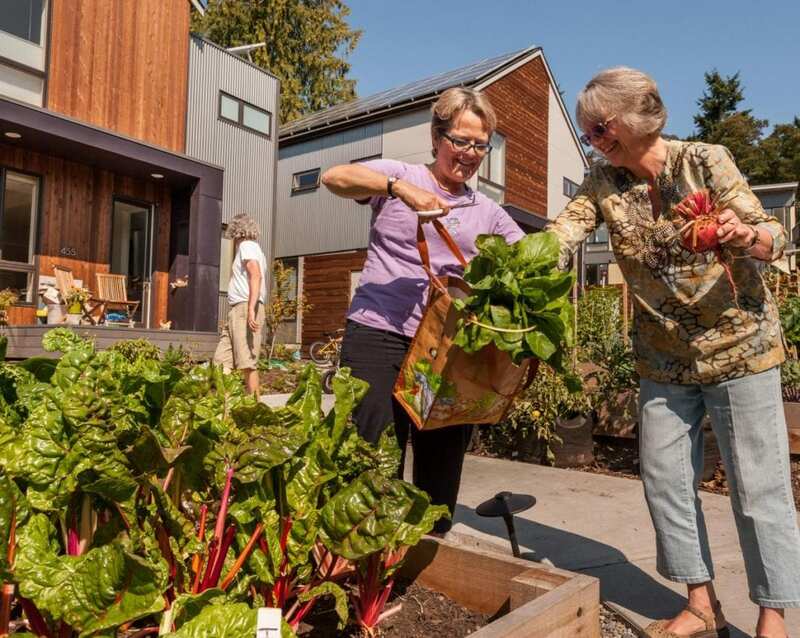 There will also be more garden space, she said, and a wider variety of unit types and sizes, including single-level homes that will meet the needs of people interested in an aging-in-place design. There will be 87 units in Phase 2, the same as in the original design, and the redesigned project will still meet HDDP criteria. 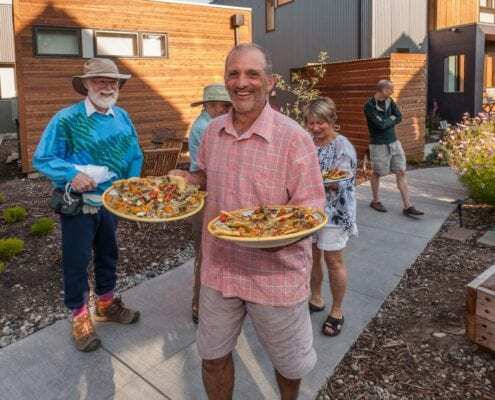 To draw up the new Phase 2 plan, GROW worked with Jim Cutler, a renowned architect whose office is on Eagle Harbor but whose work for much of his career has been on projects in distant places. 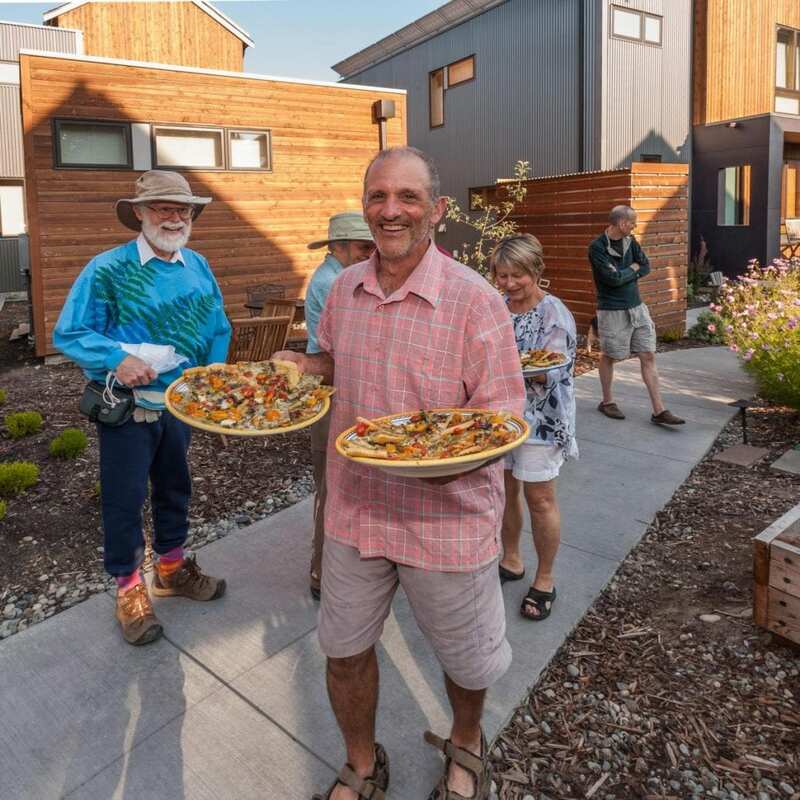 The builder he worked with a decade ago on the distinctive church with its high walls of windows was Marty Sievertson, president of Asani partner PHC Construction that’s building the homes at GROW. He suggested bringing in Cutler, who taught a University of Oregon 2012 summer program in Portland focused on environmental stewardship through design. 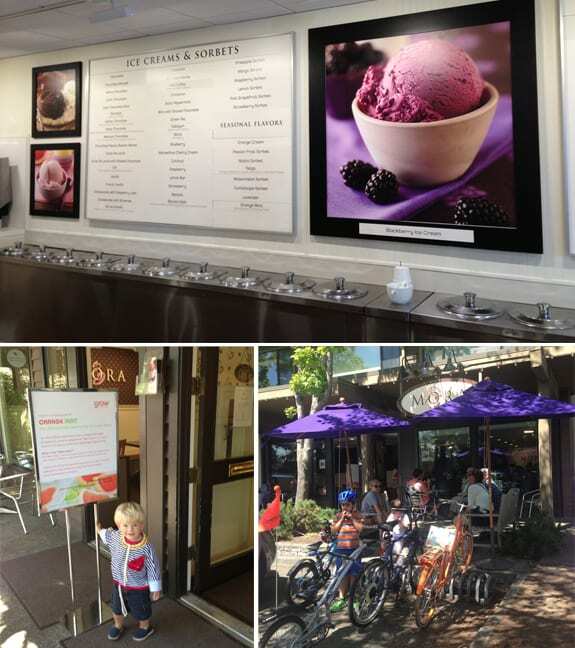 Grow Community Ice Cream! It doesn’t get better than that. 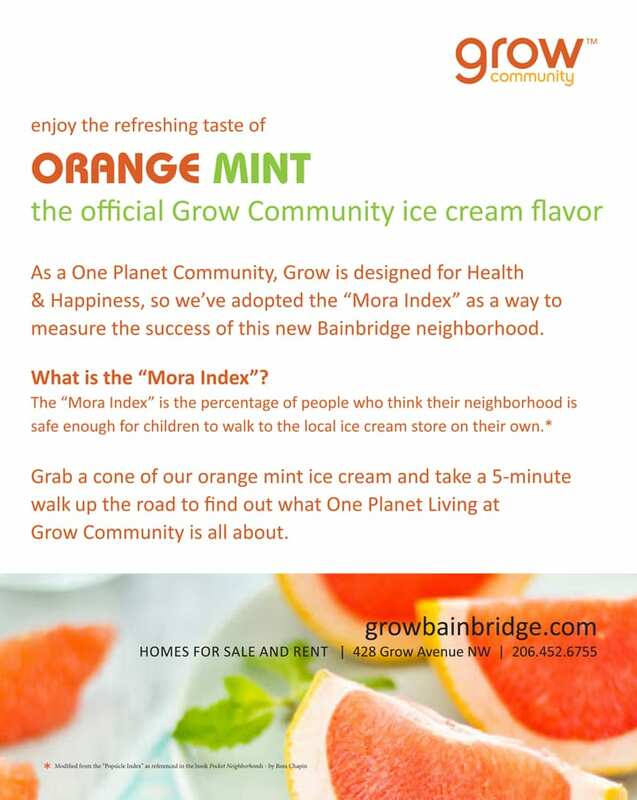 Available at Mora Iced Creamery in Downtown Winslow, just a 5 minute walk from Grow Community. For a limited time only. 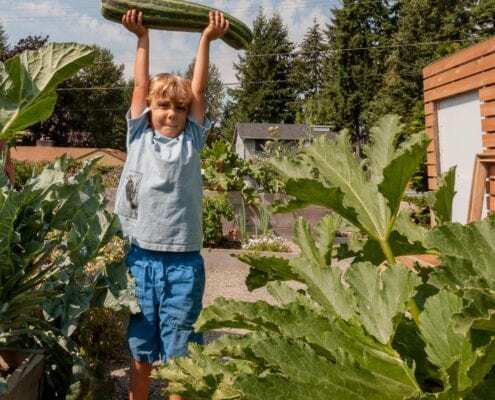 https://growbainbridge.com/wp-content/uploads/2013/08/moraphotos1.jpg 648 575 Grow Team https://growbainbridge.com/wp-content/uploads/2018/05/growlogo-300x110.gif Grow Team2013-08-06 21:45:262017-01-30 23:50:01Grow Community Ice Cream! It doesn't get better than that. 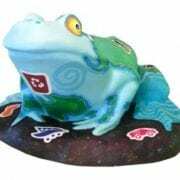 Hi my name is GROWmit, I’m a One Planet frog representing the one earth we all share, and I live at Grow Community. 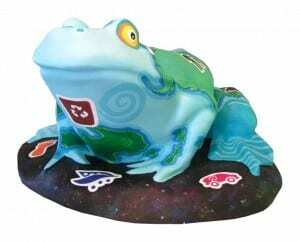 I was painted by local artist Pierr Mogan and I’m part of the ‘Frogs on the Rock‘ community art project here on Bainbridge Island. Did you know frogs like me are what scientists call an indicator species: we are particularly sensitive to changes in our environment. Toxic chemicals in the water and small changes in climate can make us very unhealthy. Many of us are disappearing because our homes have been polluted or because our habitat is getting warmer. What if frogs didn’t have unlimited clean water and air? What if WE didn’t have unlimited clean water and air? What if there were just ONE planet for all of us to share? 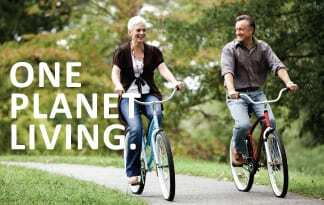 The One Planet Living® program at Grow Community envisions a world in which it is easy, attractive, and affordable for all of us to lead happy, healthy lives with fewer of the earth’s resources. 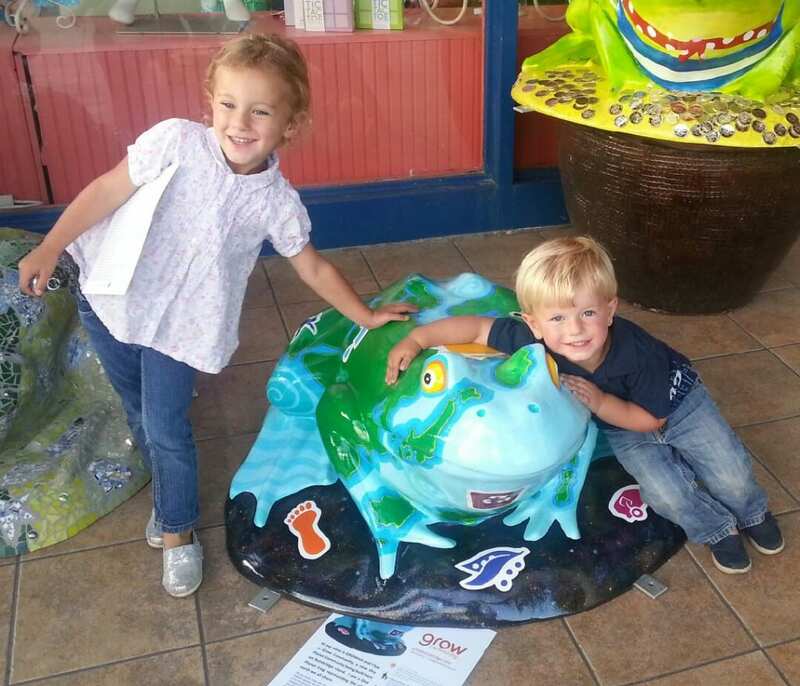 Aria and Ocean meet GROWmit! If you live with me at Grow Community, you don’t have to make big sacrifices, learn a bunch of new stuff, or completely turn your life around to live here. But you can live in a way that helps both frogs and people to enjoy healthy habitats. Come visit me and learn all about the 10 One Planet Principles that provide a framework for building healthy, vital communities. 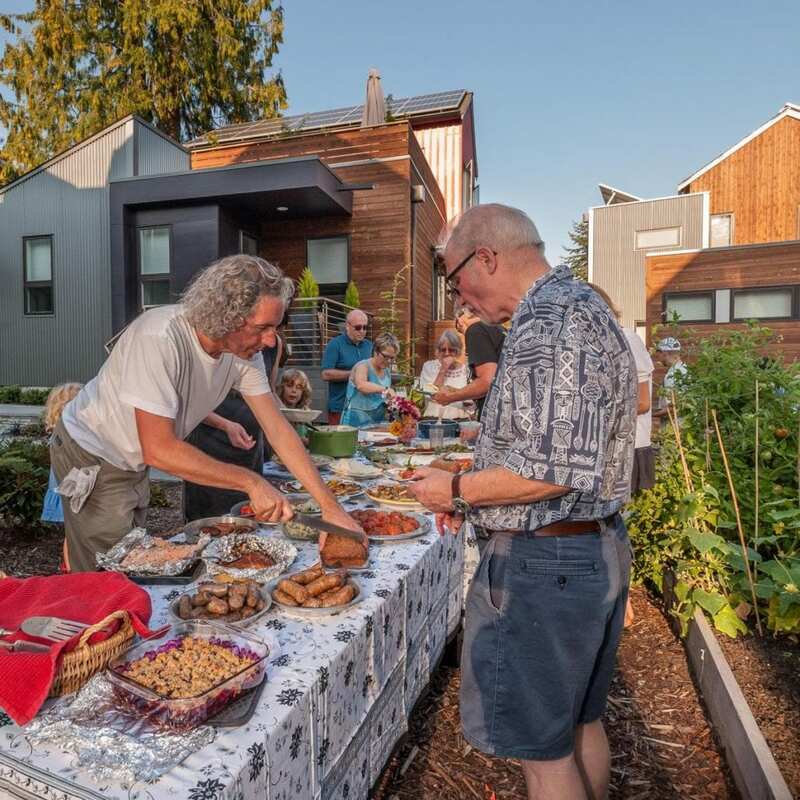 Join us to provide feedback on our site plan, home designs and floorplans for the next phase while enjoying some tasty treats and local wines.All are invited. We look forward to seeing you there! 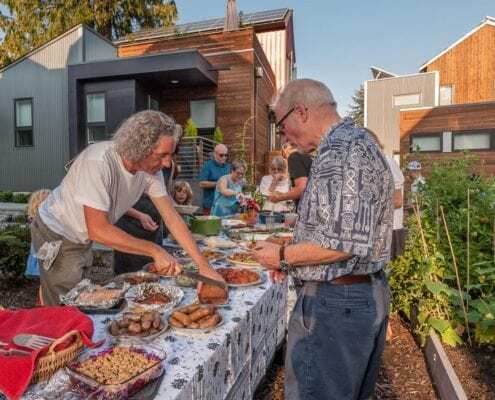 6pm – Arrive and connect with friends and residents of Grow Community. Learn whats coming next.